If you are on a lookout for marketing data specific to your industry, your search ends here. Blue Mail Media possesses strong repository of industry specific data to help you with targeted Industry Email Database. Whether you wish to connect with your B2B customers via telephone, email or mail, Blue Mail Media’s Industry Executives List can give you access to all relevant information to meet your campaign objectives. Our list is designed to eliminate unnecessary gateways in the chain of communication, and connect you with key decision makers, C-Level executives, and professionals from wide ranging industries in a hassle free manner. With Blue Mail Media, you can avail targeted Industry Email List from industries such as Information Technology, Healthcare, BFSI, Manufacturing, Real Estate and many others. Also, our team of data scientists, industry experts, and researchers put in immense efforts to keep our data repositories rich and qualitative. We follow stringent data collection, verification, and update process to make sure your sales and marketing teams achieve maximum success in their marketing efforts. Blue Mail Media strongly believes that each business has a unique set of challenges and opportunities, and thus, we provide pre-packaged as well as customized Industry Database that aligns better with your campaign specific objectives. We have been able to establish a strong network of data partners across USA, UK, Canada, Europe, North America, APAC and other regions which enables us to serve clients beyond geographical constraints. No matter which region or industry you operate in, our team will go an extra mile to help you drive greater response, conversions and eventually higher Return on Investment. How reliable is your Industry Wise Mailing List? Our Industry Wise Mailing List comes with 85-95% of accuracy rate. Also, it offers 90% of deliverability rate. The lists are verified and updated by our team of experts for every 90 days. 2. Does your Industry Wise Email List offer a customization option? Yes. Our Email List comes in both the prepackaged and customized format to meet your requirements. One can easily segment it based on SIC code, NAICS code, business type, revenue, geographical location, and other factors. 3. Can I target the business across the globe with your Industry Wise Mailing List? Yes. Using our Industry Wise List, you can target the top-level executives and decision makers in various regions such as the US, the UK, North America, Canada, Europe, Australia, Middle East, South Africa, Asia, and more. 4. What are the sources for data collection in Industry Wise Email List? Our team of data scientists gathers the data from authentic and international sources such as yellow pages, business directories, government records, surveys, trade shows, meetings, conferences, and many other. 5. What is the information you provide in your Industry Wise Email Data? 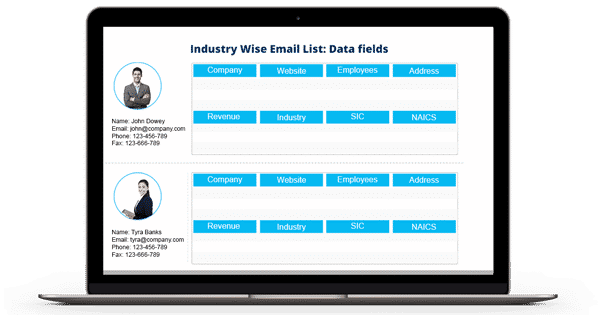 Our Industry Wise Mailing List consists of all the essential marketing information such as first name, last name, company, job title, revenue, company size, phone number, geographical location, web address, SIC code, NAICS code, and more. 6. Is your Industry Wise List GDPR and Anti-Spam compliant? Yes. Our Industry Wise Email List follows all the guidelines mentioned under GDPR and Anti-Spam law. 7. How do I get my Industry Wise Mailing List? Once you make the payment, we will email you the Industry Wise List in Microsoft Excel format.